Hackensack, N.J. native, drummer and composer Otis Brown III was destined for success in his field. Born not far from Rudy Van Gelder's legendary recording studio, Otis' mother was working as a vocal music teacher/choir director and his father a percussionist at the time of his birth. Hearing music from conception in this fertile, music rich, environment would prove to be invaluable for his future. Since his birth in NJ, Otis has traveled a path that has led to him being one of the most in demand, and well respected musicians in the world of music today. Expressing an early interest in music, Otis began his musical studies at the fertile age of 7. By age 12 he was playing lead alto saxophone in the school bands while playing the drums in the Baptist church. After moving to Newark, N.J., home of legendary musicians such as Wayne Shorter, Sarah Vaughn, Larry Young and many others, he continued performing double duty in his school bands playing snare drum in marching band, and alto saxophone in the jazz and concert ensembles all of which were directed by his father Otis Brown Jr.
Otis decided to pursue his musical education in college at Delaware State University. It was there where he truly began to develop as a musician. It was also there where he would meet legendary trumpeter Donald Byrd, an encounter that would change his life. He spent countless hours under the wings of Dr. Byrd grasping all that he could. Realizing the potential of the young musician, Donald Byrd suggested that Otis continue his studies in New York, the jazz center of the world. After completing his studies in Delaware he did just that. He was awarded a scholarship to attend the prestigious New School University. Hernandez, Lenny White, TS Monk Jr., Buster Williams, Reggie Workman, Lewis Nash and many others. The New School proved to be the launching pad that his career took off from. Not long after enrolling there his classmates began to take notice and started hiring him. Many of those classmates, along with Otis himself, are some of the top musicians in the world today. Musicians like recent Blue Note recording artist Robert Glasper, saxophonist Marcus Strickland, Interscope recording artist Bilal, recording artist Tiombe Lockhart, London's Grand Central vocalist Niko, and saxophonist John Ellis. His career took off from the New School and it doesn't seem to be landing anytime soon. Since his arrival in New York Otis has performed and toured with many musicians such as Herbie Hancock, Christian McBride, Eric Lewis, Ron Blake, Roy Hargrove, Frank Lacy, Jeremy Pelt, Don Braden, Alex Sipiagin, Marc Ribot, Adam Rodgers, Pete Malinverni, Tim Hagans, Conrad Herwig, John Hicks, Oliver Lake, Aaron Goldberg, Bob Mintzer, George Garzone, Ron Jackson and other musicians too many to mention. With the widely know fact that it takes a special kind of drummer to support vocalists, Otis is especially proud of the work that he's done with some of today's most prolific vocalists. They include Jeannie Bryson (daughter of Dizzy Gillespie), Ronnell Bey, Melissa Walker, Judi Silvano, Lisa Henry, Carla Cook, Vanessa Rubin, Bilal Oliver, Tiombe Lockhart, and Peter Cincotti. In 1999 Otis' playing garnered the attention of Grammy award winning saxophonist Joe Lovano who then hired Otis to play in his trio, quartet and nonet. He has been performing with him ever since. Otis has toured extensively throughout the United States as well as performing at all of the major festivals abroad including Italy, France, Armenia, Austria, Spain, Switzerland, Canada, Brazil, Republic of South Africa, Zimbabwe, Swaziland, Lesotho, Namibia and various other countries. He also has performed for many dignitaries and Heads of State. They include former Secretary of State Colin Powell, Vice President Al Gore, President Ronald Reagan, the Prime Minister of India, the President of Armenia, U.S. Senators Bob Kerry, Joe Biden, and John Kerry. A firm believer in God, Otis' priorities are clear in this quote from a recent interview. ...I live for God, my family, and music&. Knowing that, there's one word that describes him&.. JOY!! The JOY that musicians speak of while playing with, and being around him. The JOY that is clearly evident on audiences faces while watching and listening to him play. And the JOY that living for God, his family, and music has clearly created in this fine musician. , and an upcoming live album by the Ron Jackson trio with special guests Don Braden and Bruce Williams. 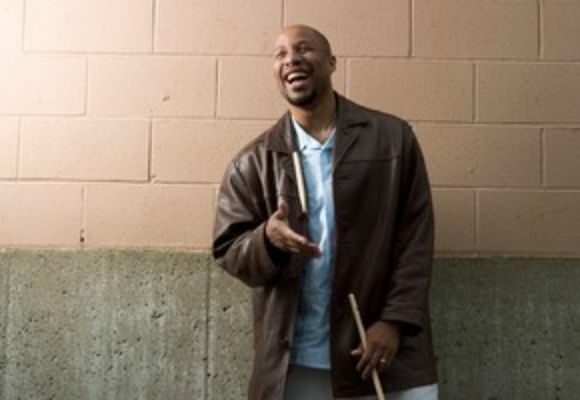 He currently can be seen touring with the Thelonious Monk Institute's Jazz in America initiative, Joe Lovano's trio quartet and nonet, the Laurent Coq trio, the Franck Amsallem trio and quartet, the Steve Wilson quartet, the Oliver Lake Big Band, the Jerome Sabbagh trio and quartet, the Donny McCaslin quartet, guitarist Ron Jackson's quartet, the Bob Stewart tuba project and many, many others.